Preheat oven to 350°F. Grease bottom and sides of a 9×9″ pan with butter. Stir melted butter with graham crumbs and press into the bottom of the pan. 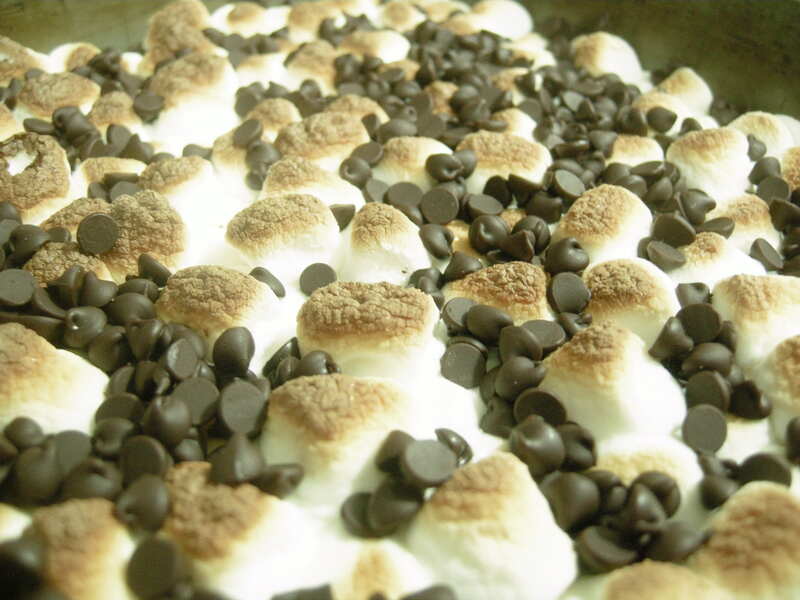 Sprinkle milk chocolate chips evenly over crumb layer and then drizzle sweetened condensed milk over chips. Bake for 25-30 minutes or until it’s lightly brown and bubbly. Place pan on rack to cool slightly while broiler preheats. Adjust the top rack closer to the broiler. Sprinkle marshmallows evenly over top and broil until they are lightly browned; about 1 minute, turning occasionally. Remove from broiler and sprinkle evenly with mini semi-sweet chips. Let cool on wire rack for at least 15 minutes before cutting into squares.